Figure A. FITC conjugated Mouse anti Bovine CD4 (MCA1653F) and RPE conjugated Mouse IgG1 isotype control (MCA928PE). Figure B. FITC conjugated Mouse anti Bovine CD4 (MCA1653F) and RPE conjugated Mouse anti Bovine CD28 (MCA5779PE). All experiments performed on red cell lysed bovine blood gated on lymphocytes in the presence of 10% bovine serum. Data acquired on the ZE5™ Cell Analyzer. 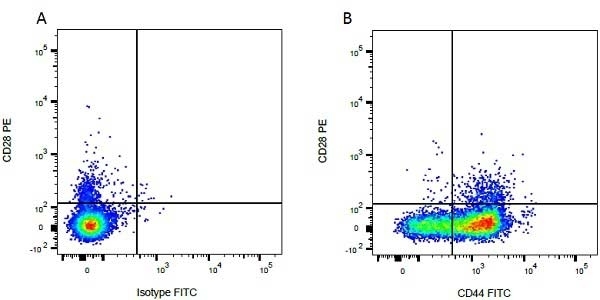 Figure A. FITC conjugated Mouse anti Bovine CD44 (MCA2433F) and RPE conjugated Mouse IgG1 isotype control (MCA928PE). Figure B. FITC conjugated Mouse anti Bovine CD44 (MCA2433F) and RPE conjugated Mouse anti Bovine CD28 (MCA5779PE). All experiments performed on red cell lysed bovine blood gated on mononuclear cells. Mouse anti Bovine CD28, clone CC219, recognizes the bovine homologue of human CD28, a co-stimulatory cell surface molecule expressed by T cell subsets. CD28 is the receptor for CD80 (B7.1) and CD86 (B7.2). 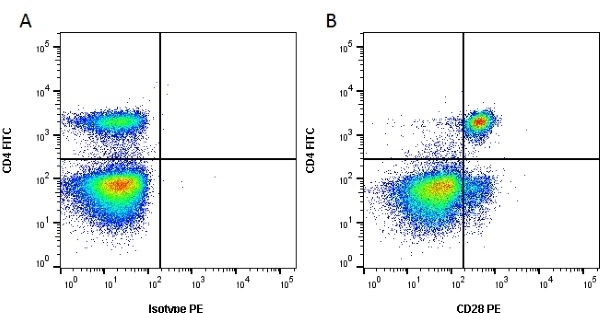 CD28 is involved in increased production of IL-4 and IL-10 in T cells. Mouse anti Bovine CD28, clone CC219 is able to stimulate bovine T cells in combination with anti-bovine CD3. 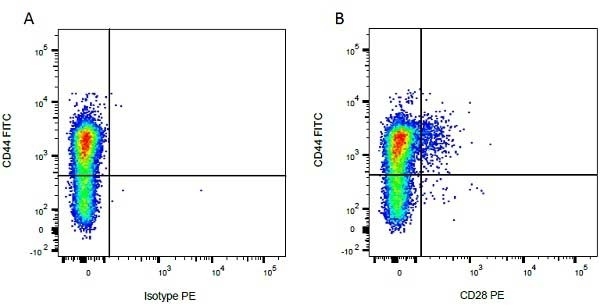 For functional studies it is recommended to use the low endotoxin and preservative free format of this antibody, MCA5779EL. Mouse anti Bovine CD28, clone CC219 has previously been published under the alternative clone designation F848EC4 (Hogg et al. 2011). Palomo, F.R. (2015) Study of the Effects Caused by BVDV and BHV-1 on Antigen-Presenting Cells by Means of In Vivo and In Vitro Experimental Models.